This is the same Commercial Grade your local Cable TV company uses to wire your House or Office Building. Our Customers use this in their Homes for HDTV and Hi Speed Internet Systems. It Features CCS Center Conductor, Dialectric Foam, Bonded Laminated Aluminum Tape inner Shield, 77% Braid Shield Middle Layer, Outer 3rd Layer of Laminated Aluminum Tape, all encased in an Outer PVC (Poly Vinyl Chloride) Jacket. Note: This is the same Commercial Grade Low Loss Cable your local Cable TV company and Satellite TV Professionals use to wire your House for Service in a 500 foot reel (vs 1000ft). Our Customers use this in their Home to distribute Satellite TV, Cable TV, TV Antenna to individual TV Set's and Cable Modem locations in short run segments. 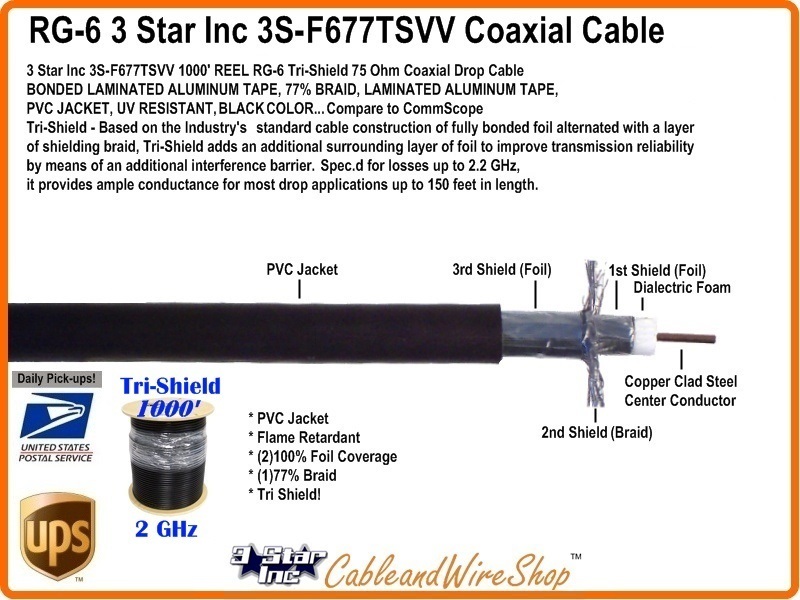 Tri-Shield RG6 will have 77% Braided Aluminum Shield Coverage Between 2 Layers of Aluminum Foil Shield, the 1st Foil Layer being Bonded to the Foam Dialectric. This an economical advantage to Quad Shield. Tri-Shield of the same material composition when compared Quad Shield will register the same signal Loss, with nearly the same Interference rejection qualities, at a minimum of cost increase as compared to regular 60% Braided Shield Coaxial Cable of the same material composition. The difference in flexibility as compared to Quad Shield is the mitigating factor for most installers as the chases and Wall-Plate spaces provided do not afford the luxury of the greater minimum bending radius needed when installing Quad Shield Cables.